The Z4 is BMW’s take on the two-seat roadster concept, replacing the Z3 that was introduced in 1995. The Z4 is BMW’s take on the two-seat roadster concept, replacing the Z3 that was introduced in 1995. Competing with cars like Mercedes-Benz’s SLK, the Porsche Boxster and Nissan 370Z Roadster, among others, the first generation Z4 was offered as both a roadster as well as a coupé - though the fixed-head car is a rarity and limited to the biggest engines. There’s an M version, too, for those looking for bigger thrills, though the Z4 is arguably at its most appealing in its lesser-engined derivatives. Dubbed E85 by BMW, this Z4 was replaced in 2010 by the E89, which gained a folding hardtop in place of the soft-top fitted to the original car dealt with here. Thanks to bold styling, a long bonnet, cab-rear stance and the front engine, rear-wheel drive layout, the BMW Z4 has masses of kerbside and driver appeal. It arrived in 2002, replacing the Z3 and bringing a bit more sophistication to BMW’s roadster offering. Early models were offered with a choice of 192hp 2.5-litre and 231hp 3.0-litre six-cylinder petrol engines. The Z4 25i came with a five-speed manual or five-speed automatic transmission, the Z4 30i gaining a sixth ratio on the manual transmission but sharing the same automatic option. Not all buyers needed the power on offer from those two big six-cylinder choices, so BMW added 2.0- and 2.2-litre models to the range, the 2.0-litre engine a four-cylinder unit with 150hp while the 2.2-litre was a six-cylinder engine, producing 170hp. Other choices would include the 25Si and 30Si models with 218- and 306hp respectively. The M models were added to the range in 2005, the Z4 M offered in both roadster and coupé guises, both sharing the same 3.2-litre six-cylinder engine with 343hp and a 0-100km/h time of 5.0 seconds. By far the biggest volume of sales was concentrated among the smaller engines, with the 2.0-, 2.2- and 2.5-litre choices dominating the classifieds. The four-cylinder unit shouldn’t be overlooked, but really the sixes are the most appealing, thanks to their smoothness and greater performance potential. All drive with fine balance, though being a roadster there are obvious compromises on the practicality/comfort front, the boot being small and the ride firm. Trim choices included SE and Sport, though all came with a good standard specification. The Z4 got a mild refresh in 2006, with incremental styling revisions and small changes to the engines' output and emissions. Being a frivolous buy it’s likely that budget is not such an issue, but even so the bigger engined derivatives will cost you more day-to-day. We’d be tempted by the 2.2 model, as it blends respectable performance and six cylinders with emissions and economy figures that don’t terrify. The 2.0-litre four-cylinder would be cheaper still, but that long bonnet really needs something a bit bigger under it, doesn’t it? 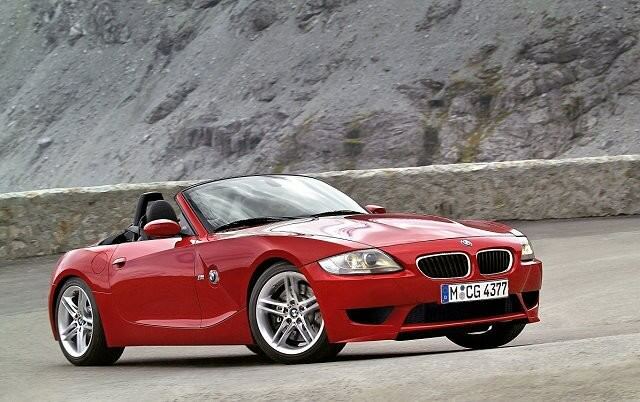 The BMW Z4 is a great-looking, enjoyable to drive roadster that’ll provide plenty of grins. An indulgent, impractical choice as all roadsters are, its styling still turns heads today, even if it’s not able to quite match the driving dynamics of its Porsche Boxster rival. The BMW will be a less expensive ownership proposition, though.